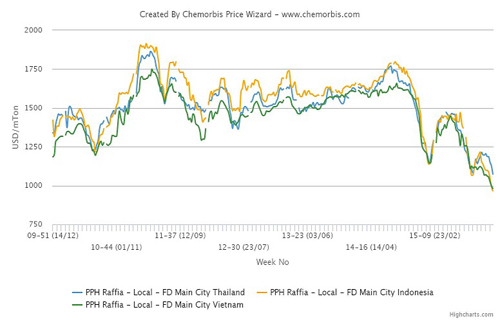 Local PP prices in several Southeast Asian markets, including Thailand, Indonesia and Vietnam, hit multi year lows as of the past week. 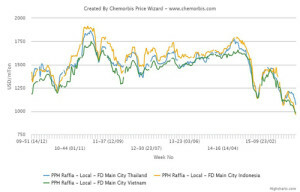 Prices, according to ChemOrbis Price Wizard, were at their lowest levels reported since 2009, when the index for Southeast Asia’s local PP market was first launched. In Thailand, general homo-PP raffia and injection offers lost THB2000-2500/ton ($55-70/ton) during this past week while, like in the rest of the region’s markets, the approaching year end and weak demand played a role in these drops. Meanwhile, supplies are not reported to be problematic with buyers comfortably able to find materials as reported on www.ChemOrbis.com.